This blog posting is the last on the former blog site http://www.pazabolivia.org. My heartfelt thanks to Julie Cleary who set up the blog on her Word press account and introduced me to the world of blogging in 2010. The links in the former blog seem to be broken beyond repair. I took that as a sign to study up, start anew, and take full responsibility for administrating the blog. There will be pages posted with the years’ highlights between 2010 and this posting. Late March and early April were great fun thanks to the presence of volunteer Alison Walsh. The Club members were thrilled to spend time with a volunteer who could help them interpret new knitting textures from our library of pattern books and magazines. Thanks to the volunteer program the women were able to buy yarn to start clothing projects during Alison’s visit and for another project to keep them busy during my 2 month visit to the U.S. Alison made samples of knitted hens, chicks, and eggs which all the women copied one afternoon while waiting for the dye pots to boil. Thanks to the volunteer program we were able to plan a group excursion. 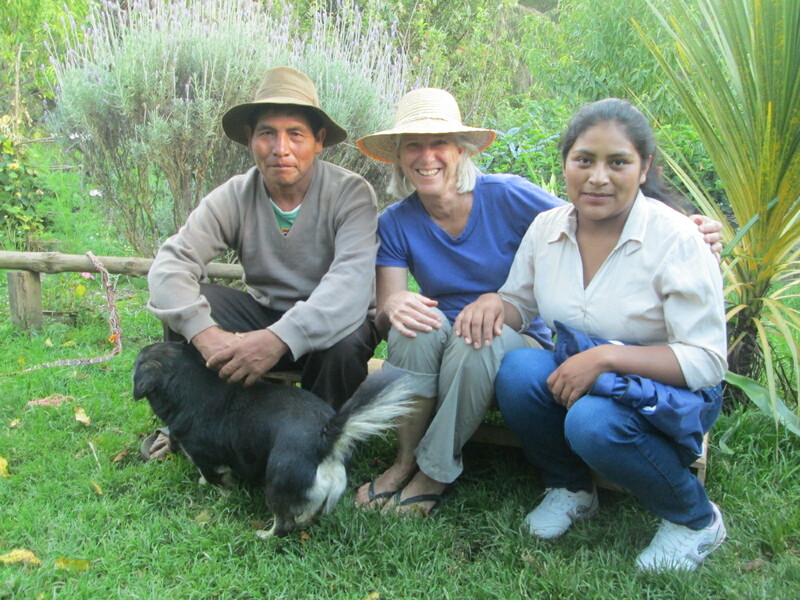 The women asked if we could visit the sodalita mine, which is a 1-1/2 hour drive from Independencia. The local sodalita is marbled blue and white stone and when polished can be confused with lapis lazuli. Huge blocks of sodalita weighing more than 7 tons were labeled for shipment to China. Polished slabs were headed to the U.S. and Italy. Piles of discarded sodalita lay waiting to be purchased by foreign artisans. 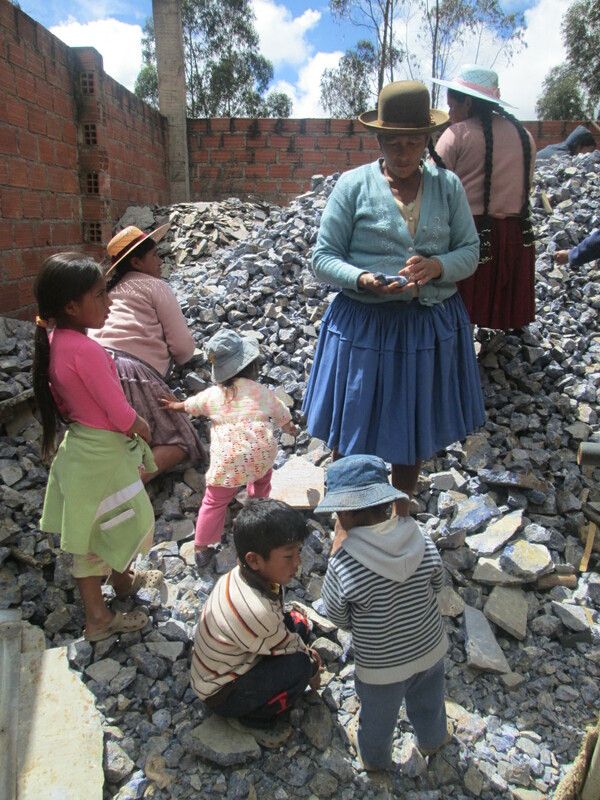 There is no craft industry taking advantage of the local semi-precious stone in Bolivia. The mining company is Italian but a Bolivian engineer gave us a short tour of the processing area as he explained the cutting and polishing machines. He ended the tour with an offer to help ourselves to a souvenir in the discarded sodalita pile. All scrambled up, over, and around the rock pile in search of the perfect keepsake. After the tour we found a shady site along a river, perfect for a picnic. The women opened pots filled with still hot boiled potatoes, noodles, rice, and fried eggs. Alison and I added avocados, tomatoes, limes, and drinks. Only 1 teenager deigned to join our outing, but 5 kids ages 10 and under were with us. All had to be called out of the shallow river where they were splashing about to eat. 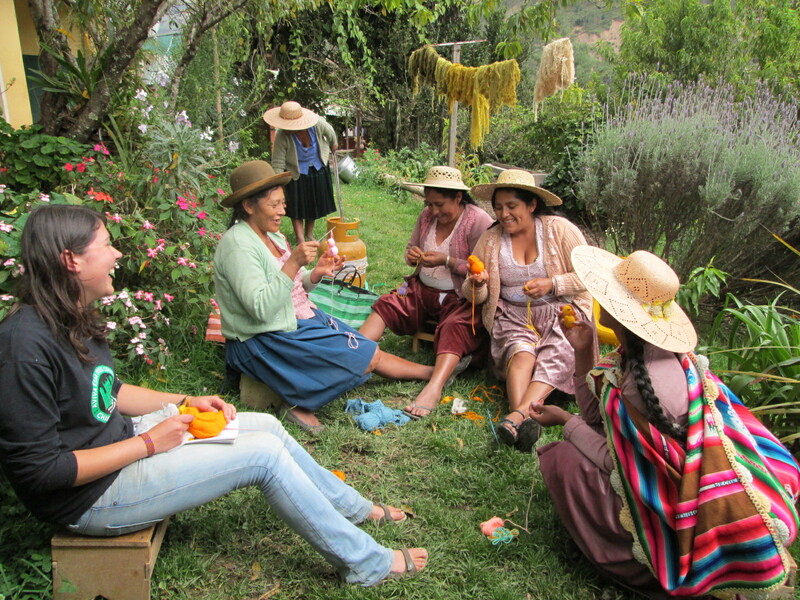 Three of the women marveled at the lush vegetation, they´d never been so far down the road bordering the east side of the municipality. 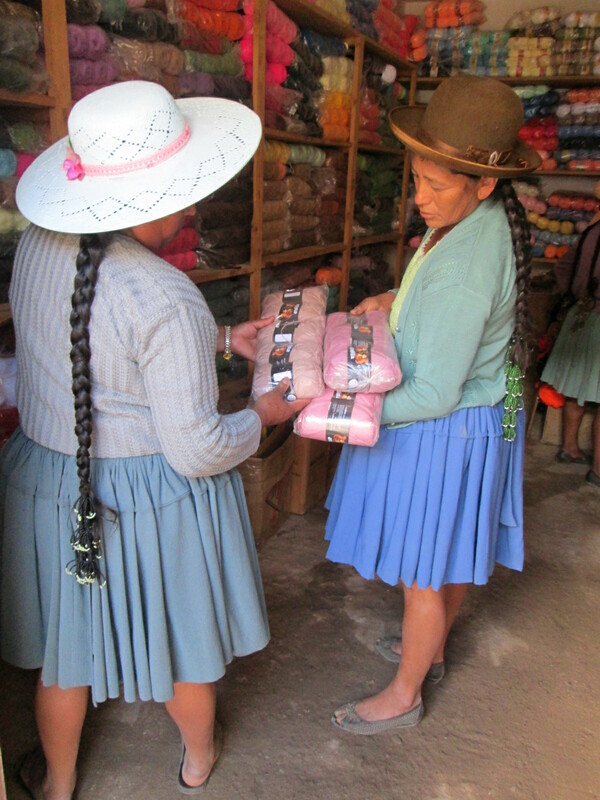 On our return to Independencia we stopped twice to pick masiq´o flowers for the dye pot. 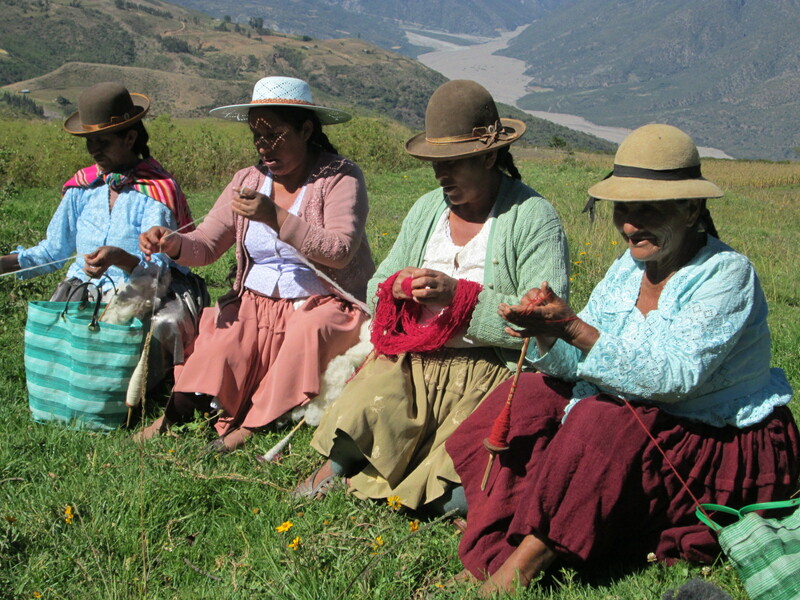 With so many harvesting we were able to collect enough of the flowers for all to dye a skein a few days later. We also noted the concentration of suyku in flower, so will harvest along the road in those areas next year. On April 4th we loaded up in a contracted truck to go to Huancarani for a dye day. 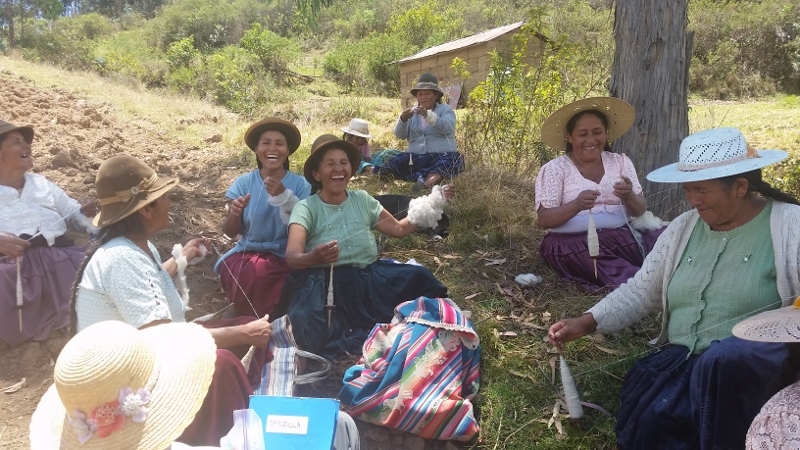 Not all the weavers can find time to collect plants and dye their skeins, and all like having a broad spectrum of dyed skeins when warping their weavings. 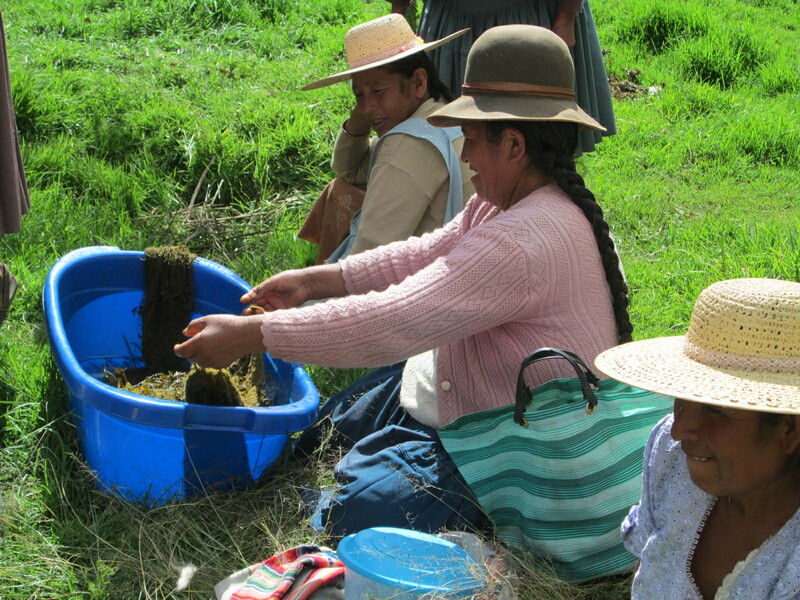 The dye day was successful with two dye baths produced from the suyku leaves and flowers mixed together and two from cochineal. The leftover cochineal dye bath was divided up and taken home. On another note I’m happy to report that nursing tech student, Noemi Chavez, is fully funded to meet the expenses of the certification process. The former Peace Corps volunteer who funded Noemi for her last 1-1/2 of schooling generously gifted to meet the certification expenses. Upon receipt of her certification Noemi can begin looking for work. Noemi and her father came to the house to receive the funds. She was traveling to Cochabamba the following day to begin the certification process, along with all the other students from technical institutes in the Departamento (State) who should have graduated in December. 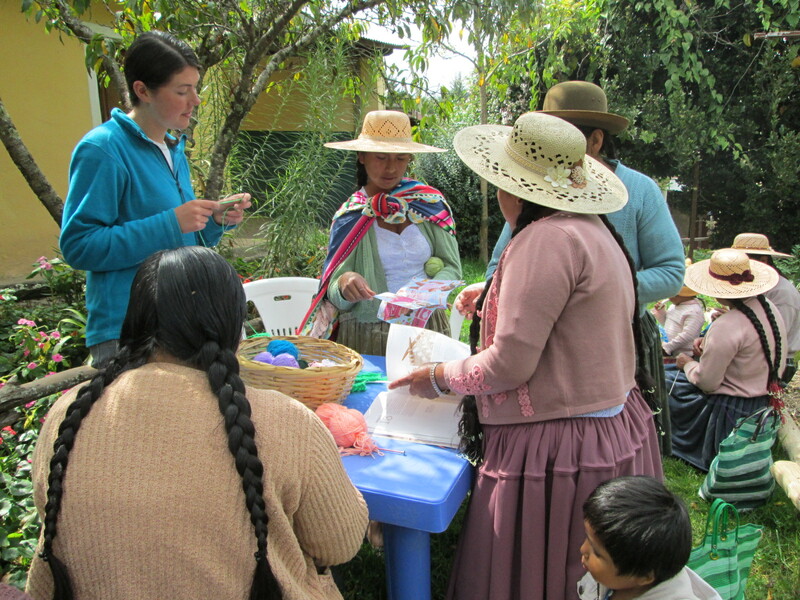 Noemi and her father agreed to the requirement that she will be prepared to assist her sister, Reyna, a member of the Club de Artesanas, further her education after graduation at the end of 2015.